Have you been sick recently? I know that my family is just coming out of a persistent and lingering head cold that turned into a fever, lot of coughing, and a double ear infection for my daughter. I also heard that folks around campus were talking about the #uncplague. Yep, it is that time of year again: Cold and Flu season, which warrants the annual reminder about what to do to not get sick. Illness is often spread by people getting the a virus on their hands from touching someone or something that a sick person has coughed on, sneezed on, or touched, and then touching their face. You may remember from the movie Contagion that people touch their face 2,000 to 3,000 times a day. This might be a bit of an overestimate, but in a recent study, random people touched their face 3.6 times an hour and with the same hand also touched common objects that others had touched. So wash your hands and stop touching your face so much. Get a flu shot. 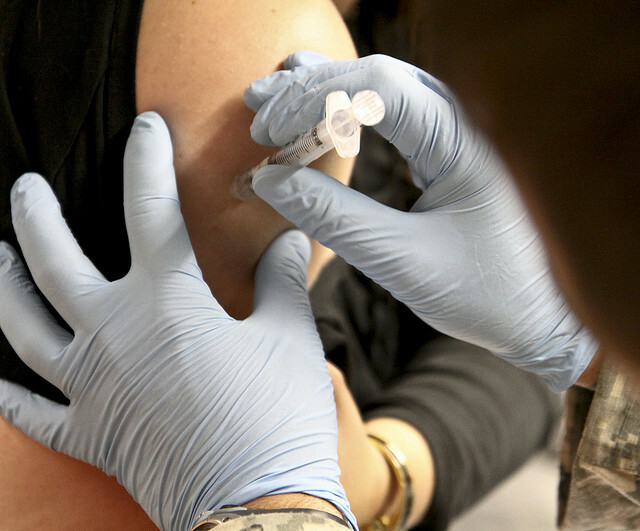 You do NOT get the Flu from a Flu shot. Let me say that again: you do NOT get the Flu from a Flu shot. Some people do get a low-grade fever and headache from the vaccine, but this is just the body reacting to the foreign substance, not the Flu. According to the CDC, vaccines given to children have saved more than 732,000 lives and trillions of dollars over the last 2 decade. There is also absolutely no evidence that the Flu vaccine –or any other vaccines– present significant harm, and the idea that vaccines cause autism is a complete myth. The worst that could happen is that the Flu shot does not provide protection for the strain of the Flu that is being passed around but, even in that case, there is nothing lost by getting the shot. Most people who work in public health will agree that vaccinations are one of the most important innovations of modern medicine and protect not only the individual getting the shot, but others around them. So each flu season, get yourself that flu shot. The vaccine usually becomes available around October and remains an option for you through at least January. This post was originally published on October 14, 2014 by Jedadiah Wood. It was updated and reposted February 19, 2016.